For starters, you better love jazz, or you're gonna be miserable, brother. The film is 100 minutes of wall-to-wall jazz. Tinkling, trumpety jazz. The story, which is 100% contrived (a fictitious reporter, by McGregor, pursuing an interview that never occurred or existed), seems a colossal waste of time, particularly in what could have been a stunning biopic. Miles Davis' entire life...but we invent fiction? Why? Why bother? Color me confused. Maybe it's an improvisational metaphor, a "social music" kinda thing, akin to jazz itself? Whatever. Who cares. Cheadle's performance, though, is pitch-perfect inhabitation, no doubt. I give him total props for his acting. And Emayatzy Corinealdi is a revelation. McGregor is his usual, hapless, fraternity brother self. Where's Waldo incarnate: there, always, yet never. Bottom-line: its being fiction, I learned nothing new about Davis, and from my point of view, that's a travesty. I was eager. 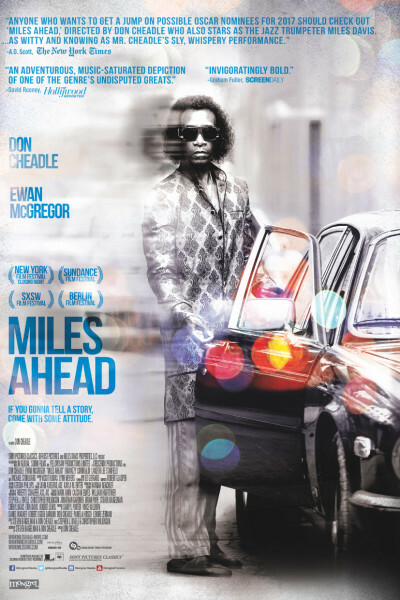 I can't imagine an actor more fit to portray Davis than Don Cheadle, right here, right now. Too bad he didn't, really.